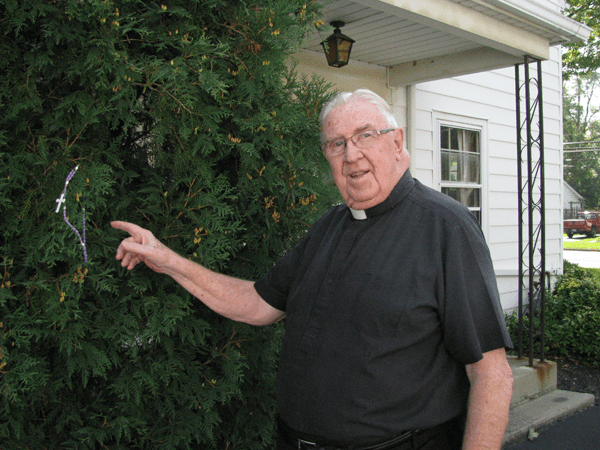 Parishioners at St. Bernard’s RC Church in Youngstown were saddened and shocked last weekend as longtime pastor Monsignor J. Thomas Moran announced he would be retiring as the year ends. Those at the 11:15 a.m. Sunday service rose to their feet and gave him a standing ovation. Many had tears in their eyes. Moran himself was visibly moved. There had been rumors of possible retirement in other years, but somehow, Moran, who will be turning 84 soon, kept on serving. A presentation and panel discussion, “Economic Vision 2016 and Beyond: Creating a Vibrant Future,” was held Tuesday by the Niagara USA Chamber of Commerce and Niagara University at the Castellani Art Museum. Gary Keith, vice president and regional economist with M&T Bank, was the keynote speaker. He touched on several points on the U.S. economy, such as gross domestic product growth, personal consumption spending and other income and employment related topics. He also mentioned the Western New York economy. The bulk, however, of his presentation was on the economic trends, progress and challenges of Niagara County. “A number of things are working for us – tourism, retail, hospitality, business services. But the sobering reality is the manufacturing part of our economy is under stress still,” Keith said. Keith stressed the importance of local leaders and members of the community, discussing how the county can help grow the workforce. “If we continue to roll up our sleeves and continue to work hard at the challenges we have in front of us, I think we can continue to make solid progress,” he said. Keith also compared the growth paths of Niagara and Erie counties. Not only did Erie County recapture the jobs lost during the main stages of the recession, as Niagara County did, but it also contributed additional jobs. With that, Keith said the “depth of the recession” in Niagara County was significantly more profound than that of Erie County. The 10th annual Operation: Rock Out Hunger, presented by 97 Rock and co-sponsored by WKBW-TV Channel 7, collected a record 4,000 turkeys during its seven-day promotion for the Food Bank of Western New York. The number of turkeys donated nearly doubled the previous record of 2,508 turkeys in 2012. Operation: Rock Out Hunger had a great kickoff with major turkey donations, including 200 turkeys from Dash’s Market, 200 turkeys from Gui’s Lumber and 400 turkeys from John W. Danforth Company and industry representatives. National Fuel announced it would match turkeys donated throughout the drive. Generous individuals and businesses continued to stop by the event with donations, 300 turkeys from Greater Buffalo United Accountable Healthcare Network, 200 turkeys from Liberatore Management Group and 400 turkeys from Carubba Collision Corp. The Food Bank of WNY is the primary hunger relief organization in Western New York, obtaining and distributing food to 326 member agencies, including food pantries, shelters, soup kitchens, afterschool programs and senior citizen centers in Cattaraugus, Chautauqua, Erie and Niagara counties. Through these agencies, every month the Food Bank of WNY serves 116,691 individuals, including 41,348 families, nearly 44,000 children and infants, and 13,194 senior citizens. State Sen. Rob Ortt, R-C-I-North Tonawanda, unveiled a two-pronged plan called “Revitalize Niagara,” which would ensure the host city and certain entities get their fair share of casino revenue, and would allocate a portion of funds for economic development and job creation. Ortt will introduce this plan as part of the 2015-16 budget talks, and negotiate amendments to the 99-h law, which outlines the casino funding formula determining the amount of revenue to local government. With the 99-h law set to expire at the end of 2016, coupled with the state’s estimated billion-dollar surplus following recent bank settlements, Ortt sounded a note of urgency. “We’ve seen how investments in Canalside from the ‘Buffalo Billion’ has revitalized Buffalo’s Inner Harbor,” Ortt said. “We need to treat the casino revenue like our ‘Buffalo Billion.’ We need to build up downtown Niagara Falls and then carry that momentum throughout the entire city, block by block, to attract more private-sector investment and tourists. #GivingTuesday is a national initiative, now in its fourth year, held annually on the Tuesday after Thanksgiving (in the U.S.) and the widely recognized shopping events Black Friday, Small Business Saturday and Cyber Monday. The event inspires people to take collaborative action to improve their local communities; give back in better, smarter ways to the charities and causes they support; and help create a better world. In congruence with Niagara University’s Vincentian mission to support those in need, students, alumni and friends collected over $3,500 and more than 1,000 pounds of food and nonperishable goods Dec. 1 in association with #GivingTuesday. Niagara University was one of six local organizations – along with Community Missions of Niagara Frontier Inc., the Isaiah 61 Project, Family & Children’s Service of Niagara, the Niagara Falls Public Library and Opportunities Unlimited of Niagara – to be included in a #GivingTuesday proclamation signed by Niagara Falls Mayor Paul A. Dyster. The Niagara Wine Trail wineries partnered with local food banks and charitable organizations to ensure a bountiful holiday season for area residents in need. During the annual “Share the Bounty” event, held Nov. 13-15, participating Niagara Wine Trail wineries accepted nonperishable food items and/or monetary donations in exchange for wine tastings to benefit the food bank and/or nonprofit of their choice. More than 2,000 nonperishable food items were collected over the three-day event along with $12,000 in monetary donations. For full story, click here. “We pause to congratulate all of the organizations that have come together in unison to make Niagara Falls a very wonderful place to live,” Owens said.